P2P networks accumulate years of history, and many applications have appeared during this time. One of the oldest sharing applications that uses a P2P network is WinMX. 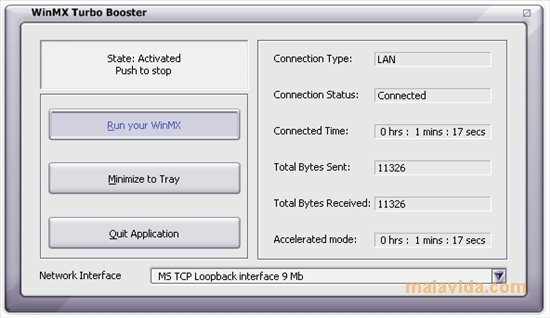 To optimize the speed and performance of WinMx to levels that you would never have dreamed, you can use a download accelerator like WinMX Turbo Booster. This application manages to optimize the number of connections with the sources that have the file that we want to download, thus improving the download speed. - Pleasant graphic interface, that is easy-to-use. - Periodic and active search for new sources to speed up the downloads. - Automatically eliminates erroneous files. - Easy access to the application's functions by means of the icon in the system tray. - Application that doesn't include publicity or spyware. 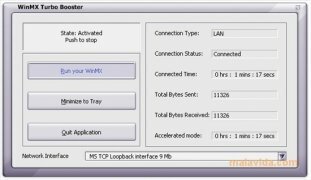 Exploit your Internet connection by downloading WinMX Turbo Booster. This download requires that you have WinMX and Microsoft Visual C++ 2005 Redistributable Package installed on your computer. It also requires an Internet connection. The free version only includes some of the features available in the pay-to-use version.